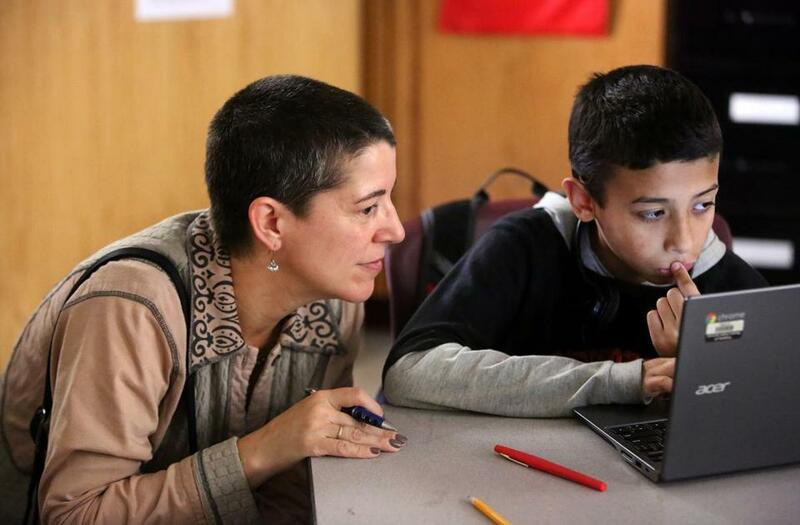 EdVestors president and CEO Laura Perille looked in on 12-year-old sixth-grader David Iovanna at TechBoston Academy in 2015. The head of a Boston education nonprofit is poised to become the temporary leader of the school system, Mayor Martin J. Walsh and School Committee chairman Michael Loconto announced Wednesday night. decided to part ways, ending a three-year tenure. The School Committee, which held an executive session Wednesday night to discuss the leadership changes, plans to hold a special meeting Monday night to vote on offering Perille the interim superintendent job and a contract. Some projects are in the early stages, some have suffered false starts, and some have been long-promised but never delivered. As head of EdVestors, Perille has worked closely with the school system to expand the arts in nearly all of its schools and to increase the rigor of math instruction. Perille served on the search committee that recommended Chang for superintendent in 2015. And a few years ago, she worked on a special advisory committee that changed the way the school system assigns students to school, moving from geographic boundaries to an algorithm that is supposed to guarantee each student receives at least six quality schools to choose from. This would be the first time in recent memory the School Committee has tapped an outside leader to temporarily lead the school system. Usually, the committee elevates someone from within to fill in. The last time the city conducted a search for a superintendent, John McDonough served as an interim leader for nearly two years before Chang came aboard. Perille, a Boston resident, could also bring a parent’s perspective to the job; her children attended and graduated from the Boston public schools. A graduate of Brown University, Perille has spent much of her career in the nonprofit world. She has led EdVestors since it launched in 2002, and previously worked for such organizations as Crittenton Hastings House and the Greater Boston Food Bank. She will face a number of challenging issues, from negotiating a new teachers contract to developing a systemwide school construction plan. 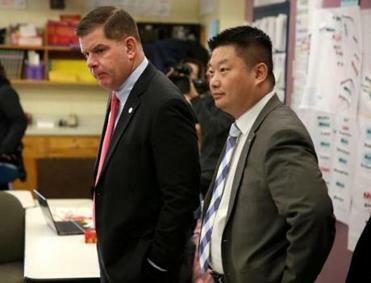 Chang, a former Los Angeles school administrator, is exiting Boston after a number of public controversies and at times a tense relationship with Walsh. This school year in particular was marked with a number of big bumps. For instance, Walsh publicly scolded Chang in November for failing to tell him about an IRS audit that found questionable spending in student activity accounts and expended political capital a month later backing Chang’s plan to change school start times at 85 percent of schools that got crushed under parent, teacher, and political opposition. Since that time, speculation had been growing that Chang wouldn’t be around long, even as Walsh and Chang insisted in public they got along, while Chang repeatedly said he wanted to serve out his five-year contract.